Adding to the growing line of Ultra UV Coaters, the Ultra 300Ai provides a solution that enhances the value and vibrancy of printed pieces at higher speeds and comes standard with a bridge unit – enabling it to receive output directly from a digital press! Heavy duty yet simple to use, the Ultra 300Ai applies a high quality gloss, satin or matte finish to a wide range of offset and digitally-printed applications, adding richness to its colors while protecting them from scratches and scuffs. Similar to other Ultra models, the Ultra 300Ai features innovative technology for coating both sides of the sheet with a smear-free finish. Print providers can offer double the value by coating both sides of the application such as direct mailers, brochures, business cards, books covers and more. With the bridge unit, printed sheets are delivered directly into the UV coater, increasing overall productivity. The adjustable bridge unit accommodates the heights of most digital presses. 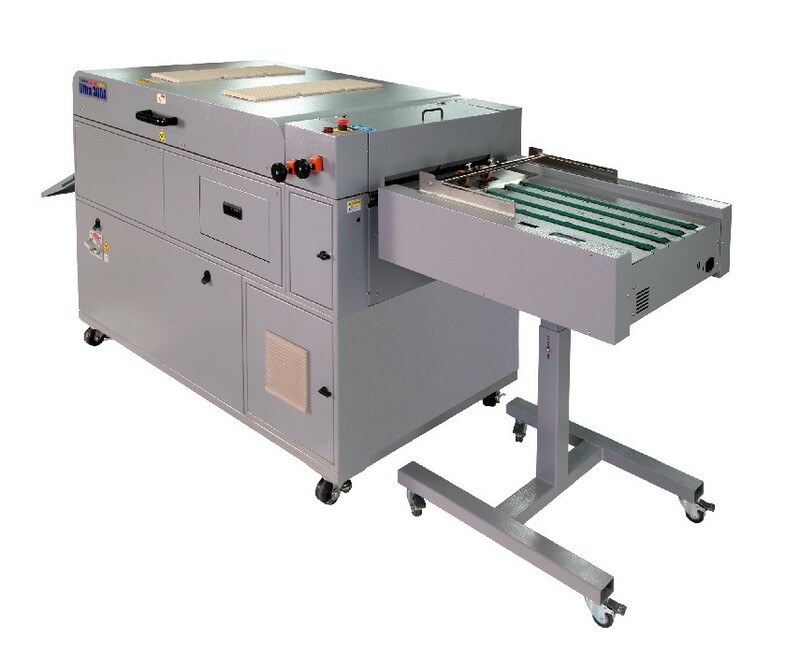 With a coating speed of up to 148 feet (45 meters) per minute, the Ultra 300Ai can accommodate the output speed from most digital presses and process a variety of paper sizes, from 8.5″ x 11″ to 20″ x 28″, up to 350gsm. For near-line feeding, the Ultra 300A model is also available with the high capacity SF-200 PLUS Suction Feeder. High in automation and loaded with features, the Ultra 300Ai/Ultra 300A provides the ideal UV coating solution for any digital print environment!